Oh, just look at you John Krasinski, with your dreamy smile and floppy locks. How are you even real? You're not. You're not. real. See? It's really very simple. Underbelly - Going here tonight!!!!!! I'd love any recommendations, especially of places that you think might fall under my "Best" categories. The Comments feature on my blog has now been updated so that anyone can leave comments without registering for Blogger. I just had to change my settings. Welcome to technology, Kim! I don't want to get too introspective here about my birthday. If anything I just want to say thanks to my mom for getting preggo, carrying me around for nine months, and having me. I hear the whole popping a baby out thing is not an easy process. In one of my absolute favorite books, My Most Excellent Year (Just read it. You'll thank me later. ), T.C. says mothers should be the ones getting cakes on their children's birthdays. I completely agree. And Dads. I know mine sure has done a lot for the sis and me. 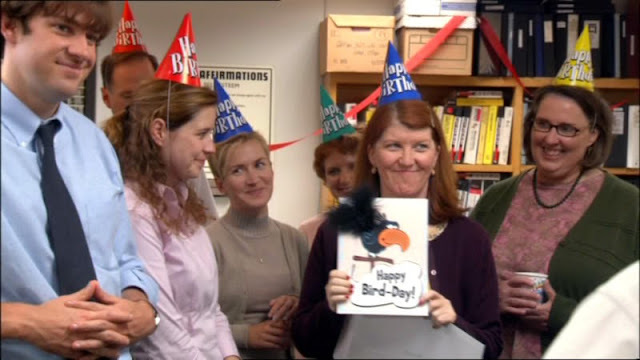 To Alex Trebek, Selena Gomez, and now the Royal Baby: Happy Bird Day to you all as well! *Spell check has informed me that "bulleted" is not a word. But it's my party, and I can invent words if I want to.